What inspired you to want to write a How-To book like this to share with other authors? As a scifi writer, I need sources for inspiration and places to go for data. I use online material every day. I read extensively. There are excellent books on world building and writing science fiction. But there was nothing like mine. The Tarthian Empire Companion is not just a how-to -- it's also a compendium of background material from my many books. I've always known I would release this book one day, and I've used some of the material to populate my 90+ page website. But this is the first it's all been in one place. What literary/cinematic influences (besides you own) did you refer to when writing this book? One of my favorite fantasy writers is Katherine Kurtz. I bought her books Deryni Magic and Codex Derynianus way back in the day (late 90s). The layout for those books and the way she put them together fascinated me. I knew one day I would write epic books that needed this type of companion so readers could look up every detail. I'd say her books (and also books about Tolkien) are my basic reference points for what I've done with the Tarthian Empire Companion. My worlds are so complex that I even created alien languages. I don't know how many individual words there are in the Felis language, but I have a separate glossary of the words and definitions that is 38 pages long. To create Felis, I researched how to create language, how it's used, how words are formed with the lips, tongue, and mouth and then extrapolated that for fanged creatures. It took me years. I've been developing the Tarthian Empire Companion since I was 18, and I'm in my 60s now. What is one thing you know for sure readers will take away from this companion? Anyone who reads this has to know I never make up stories off the top of my head. Every item in my books is there for a reason, and to advance the plot. Sometimes I don't. I think every writer has to admit defeat once in a while and go do something else. But does that mean we never write again? No. It means we come back later and try another time. We're not victorious in everything we do. Realizing that "writer's block" is okay and not a fatal disease, and that it can be overcome takes away some of the fear authors have of this problem. Reviews are one person's opinion. If I get 10 reviews and 9 people hate it, I might worry. If I get 10 reviews and 1 person hated it, no big deal. There are one star reviews on the best selling books in history. Reviews are part of being a writer. You want good ones, but you have to put up with bad ones too. Is it a valid review? Did they hit on typos and factual errors? Or did they give the book a one star review and not even finish chapter one? If a person can't be bothered to read the book they shouldn't be leaving a review in the first place. I always discount those. It's like someone saying "I hate milk" when they've never tasted it. How would they know it's bad if they haven't even read the book? What is the greatest publishing lesson you've learned in your eleven year career? That I should not have waited so long to self-publish. That has been the best move for my career I've ever made. 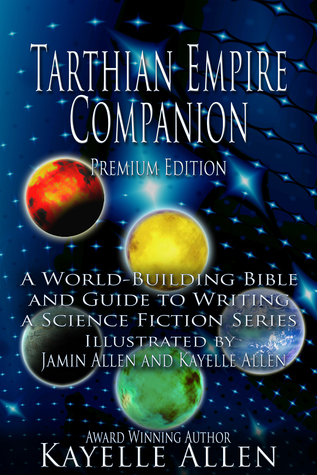 The Tarthian Empire Companion reveals the worldbuilding magic that makes Kayelle Allen's Tarthian Empire tick. You'll find 10k years of future history, peeks behind the curtain, a quick tour of the empire, a surfeit of secrets for fans, plus advice on world building and how to write a Science Fiction series, all in one volume illustrated with original art. Download a sample of the illustrated companion here!